SAMHSA-certified alcohol and drug rehab centers are facilities that have met the standards and criteria for quality and performance set forth by the Substance Abuse and Mental Health Services Administration (SAMHSA). SAMHSA was founded in 1992 as a branch of the United States Department of Health and Human Services. Since its inception, its purpose has been to improve quality, access, communication, and education regarding drug and alcohol treatment services in the United States. The organization’s National Directory of Drug and Alcohol Abuse Treatment Facilities is one of the most comprehensive guides cataloging treatment facilities throughout the United States. Another fundamental mission of the organization is guiding current and prospective community behavioral health clinics to maximize quality. Their State Certification Guide acts as a guidepost for treatment centers all over the country. What Kind of Alcohol and Drug Rehab Services Does SAMHSA Certify? SAMHSA-certified alcohol and drug rehab centers usually offer outpatient services, but it depends largely upon the state in which services are being administered. Some states use the federal money allocated by SAMHSA through the satisfaction of these criteria to fund inpatient programs, sober housing, and other ancillary treatment services. Medicaid and other federal resources are also used to fund detox and maintenance programs like medication-assisted treatment for opioid addiction through the use of medications like buprenorphine (Suboxone®), Naltrexone (Vivitrol®) and methadone. Patients looking for specialized residential treatment programs can also explore coverage through their employer-based health insurance. The criteria established by SAMHSA for certification is reserved primarily for state-run addiction treatment entities. What Are the Standards for SAMHSA Certification? Staffing – Personnel at SAMHSA-certified alcohol and drug rehab centers include treatment providers enrolled in Medicaid, as well as credentialed, certified, and licensed professionals with adequate training in person-centered, family-centered, trauma-informed, culturally-competent, and recovery-oriented care. Availability and Accessibility of Services – Eligible facilities must meet service-related criteria that allow for the convenient transition to treatment. This includes quick and localized dispensation of services, prompt intake, access regardless of ability to pay and place of residence, access to adequate crisis services, and consumer choice in treatment planning and services. Centers must also have established and documented relationships with local ER. Care Coordination – Certified facilities must demonstrate the ability to seamlessly coordinate all aspects of patient care to provide the most effective and efficient treatment. This includes knowing and documenting all care needs prior to intake and sharing information with all stakeholders in the treatment process. The scope of Services – Facilities must include a maximum choice for the populations they serve. 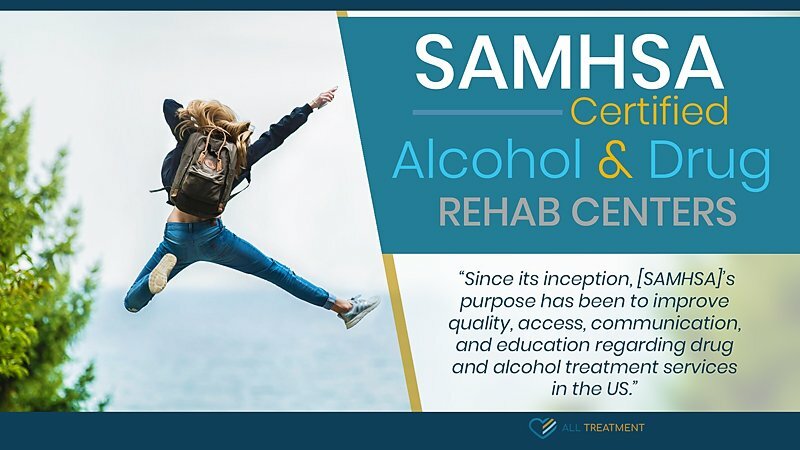 SAMHSA-certified alcohol and drug rehab centers are required to directly provide or provide through referral or formal relationships with other providers, a broad array of services to meet the needs of the population served and to do so in a person-centered and family-centered manner. Quality and Other Reporting – In an effort to streamline and fully modernize the capturing, transfer, and examination of patient records to improve care, SAMHSA-certified alcohol and drug rehab centers collect and report on the encounter, clinical outcomes, and quality improvement data and adhere to pre-established annual reporting standards. These measures drastically reduce lapses in communication that so often hinder care. Organizational Authority – This means that facilities must provide comprehensive and high-quality services in a manner reflecting evidence-based best practices in the field. All of the above criteria are based on regulations in each state in which facilities operate. SAMHSA’s standards are meant to ensure quality, patient satisfaction, and the most intuitive level of care. While no treatment is guaranteed – relapse rates continue to be between 40 and 60 percent, according to data from the National Institute on Drug Abuse – getting help at a SAMHSA-certified treatment center means that you or your loved one are getting care from a program conceived, developed, and approved by some of the leading addiction treatment professionals in the field. It means the facilities are sterile, have care practices that are the most up to date, and are staffed by professionals with the credentials to properly administer your care. SAMHSA-certified alcohol and drug rehab centers can also be the most affordable. As SAMHSA is a government-backed organization, its certification criteria are reserved for facilities who are using state Medicaid funds to administer services. This means that all or part of your treatment may be covered by Medicaid or other state funding resources should you choose to get help at a Certified Community Behavioral Health Clinic (CCBHC). We offer a comprehensive and easily searchable treatment locator to help you or your loved one quickly find help from a facility in your state. Some of these facilities will offer a comprehensive assortment of services; some will offer more specialized services like detox, medication-assisted treatment, or behavioral counseling. All those looking for treatment are encouraged to do their research with the assistance of a loved one and to ask whether or not the facility has met SAMHSA’s standards for patient care and whatever other questions they may have regarding the quality of treatment. Knowledge is power when it comes to your addiction care. Whether you or your loved one seek help at a SAMHSA-certified alcohol and drug rehab center or a private facility, the most important thing is to get help for your substance use disorder immediately. SAMHSA has been working to improve the quality and accessibility of addiction treatment resources for decades, and there are more options than ever to help you on your road to recovery. The longer you wait to get help, the larger an impact your substance use disorder will have on your health, relationships, and overall quality of life.